Arrow Sewing Cabinets: Tired of Sewing on the Kitched Table? Today I want to talk about the cabinets we offer. You may think this is just another plug, but most likely if you are reading this you are a sewing enthusiast and probably will be able to learn something about why sewing at a cabinet is immensely superior to using a folding table, T.V. tray or something that is not conducive to sewing/quilting/crafting. I have a few stats for you as well (so you know I'm not just pulling this out of the air): 1 out of 3 customers buying a cabinet did so because they were tired of sewing on their kitchen/dining room table. As a quilter or sewer you need lots of space for your material and the easy answer is a large table like the one in the kitchen, but that also means sharing your space with spouses, kids, grand kids and possibly a cat or two. This means your material must overcome food spills, crayon accidents, dirty hands, piled books and maybe even the occasional hairball.... yuck. Sewing is a hobby, and like any other hobby you need your own space. Handymen have garages, golfers have courses, athletes have workout rooms - why shouldn't you have a workspace. 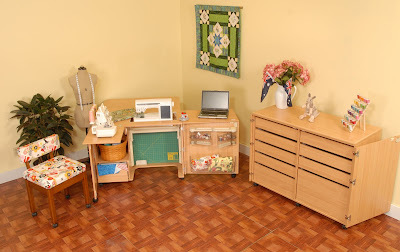 Having a cabinet or table allows you to have a designated sewing area to work on projects and store your machines and accessories. Another thing to think about is the time frame in which the majority of our customers bought a sewing cabinet: 1-5 years after the purchase of the machine. Times are tough, and hobbies suffer during tough times. Buying new sewing machines or cabinets can seem like a luxury. But I think people are buying the cabinet later after the machine for another reason. It's the awareness they get that sewing on a brand new, top of the line, computerized machine is great at first, but hunching over at a short dinning room table or looking up at your machine on a folding table is not quite so great. You need the right height, the leg room, center needle sewing, the space to the left of the machine in order to make sewing a hobby and not a chore. So maybe when you get that tax return (as we all hope will happen) maybe instead of getting a new golf set for the husband or wife, think about how your workplace can get a new doo with a Kangaroo!